With 10 million hectares, forest covers only 16% of the territory of Madagascar in 2005. Deforestation is attaining alarming proportions and is recognized as a major environmental problem. This process has recently accelerated, particularly in the southwest of the country. The main factor promoting deforestation is slash-and-burn maize cultivation. Pioneer agriculture is developing rapidly at the expense of the forest. Loss of forest is linked to several factors: demographic pressure caused by immigration, saturation of the most fertile lands, the relaxation of state regulations on forest clearing, and above all the role of maize cultivation associated with a booming export market. The maize fever causes irreversible destruction of the dry forest since the process of deforestation is followed by a process of savannization. Land clearing is a strategy for controlling resources and development of a territory. It was not until the late 1990s that environmental policies were designed to reduce the loss of forest cover and conserve the endemic flora and fauna of such a large area. The creation of the Mikea national park is currently underway. But the process has been slowed by an ilmenite mining project which poses a new threat to the forest. Furthermore, since 2008, an oil exploration licence has been granted in this area. The conflicting land uses of three government-sponsored projects destabilize local populations who have been encouraged by the state to preserve the forest. En 2005, avec 10 millions d’hectares, la forêt ne couvrait que 16 % du territoire de Madagascar. La déforestation atteint des niveaux alarmants et est reconnue comme un problème environnemental majeur. Ce processus s’est récemment accéléré, en particulier dans le sud-ouest du pays. La principale cause de déforestation est la culture du maïs sur brûlis et l’agriculture de défrichage se développe rapidement aux dépens de la forêt. Le recul de la forêt est lié à plusieurs facteurs : pression démographique due à l’immigration, saturation des terres les plus fertiles, assouplissement de la réglementation de l’état sur le défrichement des forêts, et surtout rôle de la culture du maïs associé à l’essor des exportations. La fièvre du maïs entraîne une destruction irréversible de la forêt sèche car le processus de déforestation est suivi d’un processus de savanisation. Le défrichage est une stratégie qui permet de contrôler les ressources et le développement d’un territoire. Ce n’est qu’à la fin des années 1990 que des politiques environnementales ont été mises en œuvre pour réduire le recul de la forêt et préserver la flore et la faune endémiques d’un si grand territoire. La création du parc national Mikea est en cours mais le processus a été ralenti par un projet de mine d’ilménite qui menace une nouvelle fois la forêt. De plus, depuis 2008, une licence de prospection de pétrole dans la région a été accordée. Trois projets contradictoires d’utilisation des terres financés par le gouvernement déstabilisent les populations locales qui ont été encouragées par l’état à préserver la forêt. Con 10 millones de hectáreas, el bosque cubría sólo en 2005 el 16% del territorio de Madagascar. La deforestación está alcanzando proporciones alarmantes y se reconoce como un importante problema ambiental. Este proceso se ha acelerado recientemente, especialmente en el suroeste del país. El principal factor que promueve la deforestación es el cultivo de maíz de tala y quema. La agricultura pionera se está desarrollando rápidamente a costa del bosque. La pérdida de bosque está ligada a varios factores: presión demográfica causada por la inmigración, saturación de las tierras más fértiles, la relajación de las regulaciones estatales en materia de tala de bosques, y sobre todo el papel del cultivo de maíz asociado a un mercado de exportación en auge. La fiebre del maíz causa la irreversible destrucción del bosque seco, ya que al proceso de desforestación le sigue un proceso de sabanización. La tala de bosques es una estrategia para controlar los recursos y el desarrollo de un territorio. No fue hasta finales de la década de los noventa cuando se diseñaron políticas ambientales para reducir la pérdida de cobertura de los bosques y conservar la flora y fauna endémicas de un área tan grande. La creación del parque nacional de Mikea está actualmente en marcha. Pero el proceso se ha ralentizado por un proyecto de minería de ilmenita que supone una nueva amenaza para el bosque. Además, desde 2008, se ha concedido una licencia de explotación de petróleo en esta área. Los usos opuestos de la tierra de tres proyectos patrocinados por el gobierno desestabilizan a las poblaciones locales que han sido alentadas por el estado para que preserven el bosque. Management of biodiversity or of territory? Discussion. A sustainable development model for the rural territories? This study was supported by the UR TRADE in the framework of the GEREM program (Madagascar Rural Spaces and Environmental Management Program), driven by the partnership between the IRD (the Institute of Research for Development) and the CNRE (the National Center for Environmental Research) between 1996 and 2002. This mutidisciplinary research, which involves a team of French and Malagasy agronomists, ecologists and geographers, bears upon the knowledge of interrelations between farming practices and the dynamics of the areas. I would like to thank all my colleagues: Christine Aubry, Michel Grouzis, Florent Lasry, Pierre Milleville, Samuel Razanaka and also geography students: Flavien Rebara and Parfait Mana. Several scholars have made significant contributions to the study: Emmanuel Fauroux and Tsiazonera, and I am indebted to them for their key insights and ideas. I am also indebted to Jocelyn Rakotomalala, Inter-regional Director of Madagascar National Parks, for providing me with information on public policies in this area. I would like to thank Eric Duchemin, the staff of Facts Reports for providing the venue for this article and Kenya Tillerson for the english translation of this paper. 1This research, carried out in southwestern Madagascar, in the Masikoro1region, 100 km north of Tuléar, concerns a rural zone affected by rapid changes (Fig. 1). Over the past few decades, the Mikea forest2, on a 1500 km2massif, has been converted to fields along a fast-moving pioneer front (Fig. 2). The promotion of maize farming as a cash crop, since the 1970s, for the national market and for export to the Réunion Island, is a factor largely responsible for the dynamics of the pioneer population (Razanaka et al., 2001). The cultivation system of slash-and-burn practiced is called hatsaky locally. Maize farming continues to expand at the expense of forested areas. The problems of deforestation here, in a semi-arid zone, are compounded by a process of savannization (Kottak et al., 1994). Figure 1. Masikoro region and geographical characterestics of Madagascar. Pays masikoro, Masikoro country; escarpement occidental des hautes terres, Western escarpment of the highlands; contact socle cristallin (est)/système sédimentaire (ouest), contact crystalline basement (east)/sediment system (west); escarpement oriental de l’Angavo, eastern escarpment of the Angavo;, major rivers and tributaries. 2Beginning in the 1920s, the region was colonized by small groups of Masikoro ranchers. 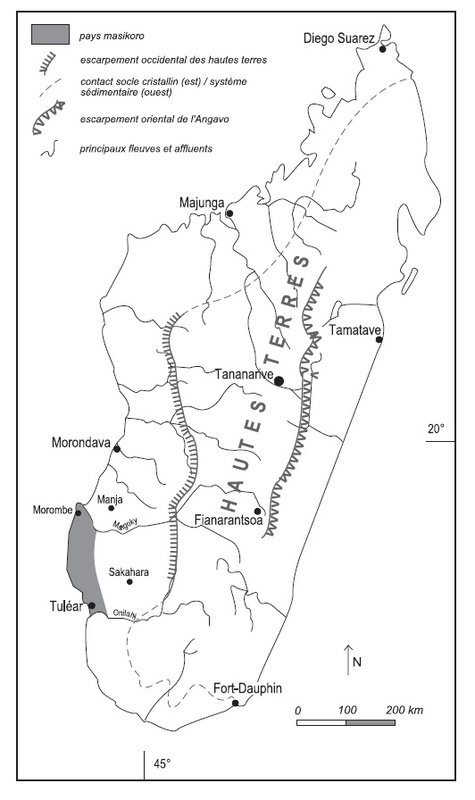 The farming territory then grew into the Antseva corridor and the eastern lands and was associated with the large agricultural boom that affected the region: first the Madagascar beans (Phasealus lunatus, kabaro) between the two World Wars, and cotton since 1980. Since their arrival, the Masikoro have welcomed migrants. The Tandroy have played an important role, as farmers in the east, then as settlers clearing the land in the west. 3This paper about deforestation describes the processes by which deforestation occurs, combined with an understanding of the local human and environmental context (Blanc-Pamard et al., 2004). The text then presents the environmental projects underway for protecting biodiversity (Seddon et al, 2008). Despite these projets, the future of this forest is still uncertain due to a multi-national mining project which will extract deposits of ilmenite from the area. An oil exploration licence in this area further compounds the problem. 4This research comes is based on a political ecology approach, which highlights the role of politics in shaping human-environment relations and by raising the question of the governance of territories(Zimmerer and Bassett, 2003 ; Neuman, 2005 ; Zimmerer, 2006). 5The region is characterized by a sub-arid climate with annual precipitation between 600-1000 mm. 6The original vegetation, at the expense of which this farming is established, corresponds to the series of multilayered dry forest at Dalbergia, Commiphora and Hildegardia (Humbert and Cours-Darne, 1965). An intermittent layer of trees that are able to reach 20 m in height dominates a continuous layer of dense trees about a dozen meters high. The shrubby undergrowth is rather sparse. The herbaceous layer is nonexistent. Nearby one finds the savannah, characterized by a grassy layer largely dominated by Heteropogon contortus and a woody layer dominated by Poupartia caffra (Morat, 1973; Grouzis et al., 2001). The Mikea forest has attracted the attention of international conservation groups because of its high biodiversity value, with several rare and local endemic species of reptile, amphibian, mammal, bird, invertebrates and plants. 7Slash-and-burn cultivation constitutes the main cause of forest clearing (Milleville and Blanc-Pamard, 2001). For farmers, clearing and burning this wooded biomass is the first step in setting up a field.They then cultivate maize for five years until nutrients are exhausted and weeds proliferate, then move on, abandoning the field. As a consequence, dry forest is permanently lost (Grouzis et al., 2001). 8The study of the dynamics and modes of deforestation of the central portion of the Mikea forest was carried out with the helpof a diachronic study realized through aerial photographs taken in 1949 and satellite images from different periods (1986, 1997, 1999, and 2001), combined with ground-level work and low-altitude aerial reconnaissance (Lasry et al., 2001). The expansion of maize farming on slashed-and-burned land is intense and spectacular. Nearly 55% of the Mikea primary forest was cleared between 1971 and 2001, on average 12.5 km2 were lost per year. This pace accelerated considerably over time, from 5.9 km2/year to nearly 20 km2/year between 1986 and 2001. The clearing front in 2001 was located 18 km from RN9; in 1973, it was only 7 km away (Fig. 3). The very existence of the Mikea forest is, therefore, compromised in the short-term. Clairière, glade; lot forestier, forest lot; forêt mise en défense forest exclosure; îlots de hatsaky dans la forêt en 2001-2002, hatsaky islands in the forest; limite de la forêt cultivable, border of forest cultivation; limite 1986 du front de défrichement, border of the clearing front in 1986; limite 1996-1997 du front de défrichement, border of the clearing front in 1996-1997; limite 2000-2001 du front de défrichement, border of the clearing front in 2000-2001; limite 2001-2002 du front de défrichement, border of the clearing front in 2001-2002; piste, track; route, road; layon, transect; campement, camp; village, village. 9Our study concerns more particularly the village of Analabo and the villages and encampments established by the inhabitants of Analabo, members of one of the two founding clans, the Lazafara clan. At its installation in 1940, the Analabo site bordered the western forested massif, the Mikea forest. The clearing front in 2001 was 11 km west of Analabo. These changes occurred over seven decades. Thus, Ampasikibo was founded: 1922; Analabo, 7 km west: 1943; Anjabetrongo, 10 km west: 1982; Andraketa, 15 km north: 1997 (Fig. 3). These four inhabited sites reflect the westward march of a maize culture that follows the forest. 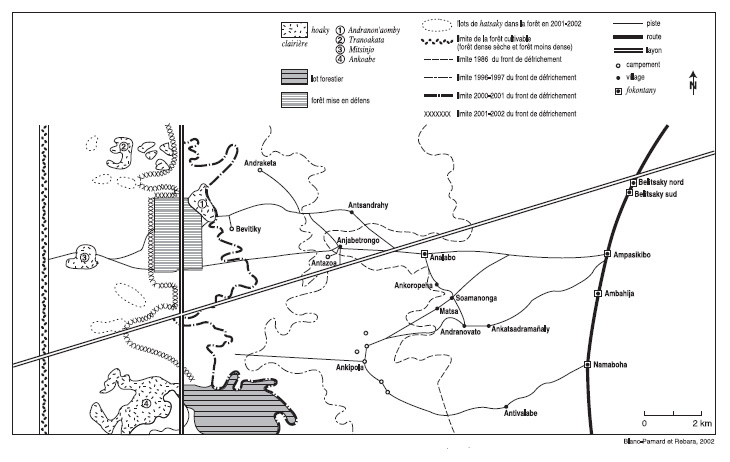 10Figure 4 summarizes a historical sequence of the development of the territory, from 1922 to 2001, from Ampasikibo, then from Analabo. Terres de pâturage, grazing land; terres de culture, cropland; forêt défrichée à l’extérieur du terroir d’Analabo, cleared forest outside of Analabo. 3 Tompon-tanà: Founder of the village, first occupants, tompon-tany: natives, masters of the soil. 11The Ampasikibo village dates from 1922. The two founding members (tompon-tanà3) are the original Masikoro from the village of Berorohain the low valley of the Manombo, brought north by the reduction of pasture land for developing agriculture – considered a zone free of human beings – where they found replacement pastures4. They were rejected by the inhabitants of Beroroha, who were equally attracted by the quality of arable land, notably the possibility of land gained along the Androka River. Other Masikoro migrants then arrived; also the Tandroys and the Mahafale from the southern part of Madagascar. 12When they began their settlement in the 1920s, the founders, Masikoro ranchers, marked for themselves a vast rectangular territory, covering 5 km from north to south and more than 20 km from east to west. The northern, southern, and eastern boundaries were established with their neighbors. The east was reserved for agriculture. In the west, pasture land encompassed both savannah and forest. 13The forest, a support environment of multiple resources, plays an essential role in daily life. It is a food source for men (harvest and hunt) and for zebus, and also a source of materials for construction and tool making. It is a strategic refuge for hiding, a place populated with spirits and mythical creatures which belong to Zanahary (the creator God). The forest must be used with moderation and respect for the spirits who live there. Like air and water, the forest is considered unlimited, therefore it does not constitute a risk because it is not rare. A major asset of the Masikoro system are the zebus, and it is important to have an appropriate distribution of pasture so that the herd prospers and has shelter from thieves (Fauroux, 1999). 14The forest is a pasture during the dry season and the herd finds shade and water; the savannah is a pasture during the rainy season. The pastoral activity has defined the Ampasikibo’s territory west of the national road, a territory which stretches very far towards the west without a well-marked border in the forest. 15The settlements in the forest in 1940 began with the exploitation of the forest for timber. The village of Analabo was created by the inhabitants of Ampasikibo, 7 km west of this village, at the edge of the forest. The current Analabo site dates from 1943. The first hatsaky date from 1963. 16The forest began to be cleared for agricultural purposes only since the 1970s, and since then, the considerable expansion of maize farming on slashed-and-burned land has continued unceasingly. The march towards the west continued, due to the decline, at the time, of the farming structureand the flood of migrants into the villages of the pioneer front. 17The years 1980-84 marked a new stage in deforestation under the combined effect of forest exploitation (including logging) and agricultural clearing. Due to the influx of migrants in villages on the pioneer front, the westward march continued. At the same time, in the eastern part of Ampasikibo, the cotton boom (succeeded by Cap peas) took over the lands which were formerly freely accessed by the herds, and which therefore were not liberated until after the cotton was picked, in July: the clearing for maize continued towards the west. 18Since the 1980s, the process accelerated with the arrivalof major farmers, the farmer-ranchers with a significant number of cattle. New encampments were created. 19A new phase began in 1995, which fostered a different relationship with the forest. Newcomers (Masikoro migrants from the south, but also Vezo, Tandroy, or Mahafale) no longer felt the need to petition the tompon-tany as the remote forests were considered free access. Everything happened from that moment on as though the land belonged to no one. Clearing took place more than 10 km from Analabo. Control of access to the land was no longer in the natives’ hands. Since the 1990s, the availability of the family workforce, and, above all, the possibility of using a salaried workforce ensured that the most prolific farmers could clear large areas. The wage earner was an important part of the original southern groups’ revenues, the Tandroys’ and the Mahafales’. 20The period 1999-2001 was characterized by a spectacular intensification of deforestation for several reasons. Clearing always continued farther west, but the penetration of the forest resulted in heavy constraints such as the increasing distance from RN9 and the water supply. Uneven access to the forest has become a factor of differentiation between farmers. The clearing of the pioneer front was the work of certain local mpañarivo, wealthy farmer-ranchers of Analabo, or of the peasants of the villages along RN9, thwarted by cotton farming in the east. 5 Called « Vision Durban ». 21The main factors that need to be considered, since the early 2000’s, are continued land clearing, the population’s rising awareness of participative forest planning, innovations aimed at helping small farmers to recultivate fallow land, and since 2003, the urgency of creating a protected area (Méral and Raharinirina-Douguet, 2006). This protected area is in line with President Ravalomanana’s 2003 annoucement5 at Durban that by 2008 the country’s protected-areas network will be tripled from 1.7 million hectares to 6 millions hectares. 22The forest is a reserve but also coveted land, and its clearing contributes to territorial appropriation.Our research bears on the dynamic aspects of the use of the soil, most particularly the progression of cultivation and the spatial arrangements that follow from it (Blanc-Pamard and Rebara, 2001; Blanc-Pamard, 2002 b). 23Land is accessed by clearing and farming the allocated portion of the forest. When the land returns to fallow, the right of the axe involves, for the clearer and his descendants, a right of long-term usage. In theory, this right disappears when the usage ceases; but as the forest is rapidly diminishing, each farmer intends to appropriate the cleared land. This system of land possession puts the farmer, and his family, his residence, his occupation with the land, and therefore his work, in the foreground. It is adapted to situations where one endeavors not only to attract newcomers (and therefore to concede to them the use of the land under favorable conditions) but also to retain these very men while denying them the right to conserve this land if they stop exploiting it and reside there. 24The length of residence bestows upon the founders authority over the land and a permanent, collective right of usage. These are the tompon-tanà, the first occupants, who did what was necessary to obtain the protection of Nature’s spirits, and are the true proprietors of these places. They opened fields in the forest, established villages and acquired a right over portions of the forest. The forest is freely conceded to foreigners or mpivahiny. A foreigner is one who comes from another village. The natives give authorization for settlement in the forest, for a hatsaky, to migrants with whom they contract an alliance according to the traditional rules (honorary relationship; ziva, blood relation; fatidrà, marriage). 25True matrimonial maneuvering was employed by the founding clans to maintain control over the forest and to increase the settlers’ privilege with the objective of consolidating a forest territory. 26Practices were different depending on whether it involved a son or a daughter. On one hand, the matrimonial strategy consisted of taking “forest women” (“a young native man who followed the forest was interested in marrying a Mikea woman”) and, on the other, keeping daughters and sisters in the village by marrying them off to foreigners (Tanosy, Tandroy, Mahafale), who came to live there. Marriage permitted, by land access, a social introduction into the territory. Currently, the choice of spouse is thus part of a territorial and fundamental strategy of the community. 27Foreigners who used marriage to gain land allowed the founders’ daughters and their descendants to stay where they were, but the founders had to see to it that a necessary forest patrimony was maintained before giving their sisters and daughters in marriage. The marriage of their sons to Mikea wives permitted the clearing to intensify on the distant periphery, while the daughters’ marriage to foreigners permitted these men to become integrated into the territory with their descendants. 28Maize farming is a space-devouring activity. From year to year, the forest recedes. In 2001, the farther-reaching hatsaky from Analabo were in the northwest, 10 km beyond Andraketa. During the 1960s, the first hatsaky were located less than a kilometer from Analabo. 29The forest, in 2001, was barely over 8% of the total area of the Analamisampy commune, as opposed to 41% in 1971. The erosion of biodiversity proved to be very high; deforestation engendered the disappearance of 75% of the original species of vegetation, among which were species of high economic value, exploited as wood for work or used as medicinal plants. 30Under the pressure of an increasing population and desire for land, deforestation has amplified. The current dynamics are based on an expansion that nonetheless is nearing its end since, according to the peasants, “the forest will soon be gone.” Farmers foresaw this advance and reacted by clearing fields within the forested area, so as tobe the first to obtain large plots of land -- their ownership would not be challenged later, and these pockets were eventually included in the farmed zone. 31Natives and foreigners, by diverse alliances, are the local forces bearing on development of the forested territory and its appropriation. In a context where land rights remain insecure, deforestation allows accessto land. It is furthermore the guarantee of forest regulation for the future. Currently, for farmers, the value of the forest remains, in a paradoxical, economic and land context, in its disappearance. The current clearing aims at appropriating land resources, in anticipation of a saturation of space. 32The villages and encampments are structured by family connections, and then are developed by marriage ties with the goal of consolidating a territory in the forest. The territory is composed of a reticular space that is increasingly spread out and linked by family relations between its inhabitants. But this social order established by the first occupants whets the appetite of other expansionist farmers, farmer-ranchers most often, who dispute them over the available space within their own territory. 33This research on the Mikea forest extends the work conducted on the Malagasy forest. All studies conclude that these forests are threatened by slash-and-burn cultivation, combined with demographic growth (Jarosz, 1996). 34The environmental destruction appears to be a strong threat for the island but also for the planet, as Madagascar does not escape the new environmental order whose legitimacy falls under the universal norms. Madagascar has acquired, since 1990, an Environmental Action Plan (PAE, Plan d'Action Environnemental) whose third phase (Environmental Program, PE III), has been in place since 2002. Local management of renewable resources is part of the institutional innovations proposed recently as far as sustainable management of Madagascar’s forests is concerned. Madagascar acquired, during the years 1996-1997, a judicial structure decentralizing the management of renewable resources. The GELOSE (GEstion LOcale SEcurisée) law of 1996 permits the elaboration of national renewable natural resource (RNR) management policies by the local communities concerned. 35In the framework of decentralization, the it is expected that sustainable environmental management will be taken in hand by local village structures and communities. Since then, an entire group of local actors was put in place around the environment, and above all, its management. In fact, local actors are motivated less by the desire to defend the environment for its own sake than to control the land and exclude other social groups. 36We hope that the results of this study will provide a frame of reference for the erosion of biodiversity, from which decision-makers will be able to make planned efforts to protect this area of high biological value. 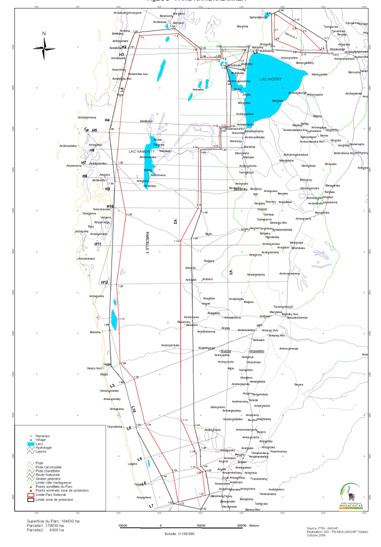 37In 1998, the Appui à la Gestion Régionalisée et à l'Approche Spatiale (AGERAS)6, an agency executing PE II in the framework of the Office National pour l'Environnement (ONE)7, prompted the mayors of fifteen of the nineteen communes in the Toliara II district – concerned by the degradation of the Mikea forest – to create an association to protect the forest, the Flkambanana MIaro ny Alan’ny Mikea (FIMAMI)8.A charter of responsibility for the fifteen communes was established with the global objective of “a rational and sustainable management of natural resources in the Mikea forest”, involving the local populations. 38The Worldwide Fund for Nature (WWF), after a reconnaissance phase from 1998 in the framework of the “Dry Dense Forest in the South and Southwest” Program, is operational since 2001 in the “Mikea sub-ecoregion.” A first measure consisted of giving a bonus to those who cleared the smallest area of forest. This measure is consistent with the logic of agri-environmental bonuses, which are used in Northern countries as in the south. Their objective is to limit deforestation locally without dealing with the earlier issues which are at the heart of these practices. The Mikea forest has been a pilot area for the application of this measure. The political crisis that the country experienced from December 2001 to July 2002 interrupted this initiative. Later, the same year, a Joint Committee consisting of the WWF, Conservation International (CI) and ONE worked with the Malagasy military and court system to put an end to slash-and-burn maize cultivation. 9 Service d'Appui à la Gestion de l'Environnement, Environmental Management Support Service. 39The WWF continues to work with Service d'Appui à la Gestion de l'Environnement (SAGE)9(formerly AGERAS), which retained external intervention as the solution to curb the erosion of biodiversity. In 2003, WWF received a mandate from the donors to initiate protection of the entire forest. WWF leads the inquiries to define the zoning of the protected area (PA) and to evaluate the timeliness of setting up contractual arrangements on the periphery. In 2005, the surface of the forest was evaluated at 370 000 ha. 40The process of creating the park began with the intermunicipal organisation, FIMAMI. A PA, with a National Park (Category II of IUCN) at its heart, around which a category V PA is planned, will be jointly administered by thelocal communities. Establishing this area means restricting access of the local populationsto resources. The negotiations began in 2006 and were not finalised until 2008. The donors, with the support of the Government, have requested a social and environmental conservation plan before the promulgation of the decree creating the new PA 10. 12 A State organism that deals with natural resource management, in particular biodiversity. 41In November 2008, the regional committee11 for the creation of the National Park approved its boundaries on a total surface area of 184 630 ha in two parcels (Fig. 5). The application for the creation of the PA, which will be submitted to the Supreme Council for Nature Protection12, is being finalised. Furthermore, zoning for touristic activities is under consideration with the setting up of infrastructure and the development of a tourism industry (including seaside tourism) that involves the local communities. Hameaux, hamlets; village, village; lacs, lakes; hydrologie, hydrology; layons, transects; piste, track; limite parc national, border of national park; limite zone de protection, border of protected zone. 42The actors that are the most reluctant are those for whom the PA would bring an end to their illegal activities such as the maize trade, timber exploitation or the exploitation of other natural resources, and also to their enrichment via illicit practices. 43Negotiations with the local populations on the boundaries were rendered even more difficult, and delayed, due to the exploration of an ilmenite deposit, the pitheads of which are located within the forest covered by the National Park. 14 The company Exxaro Resources Limited has replaced Kumba Resources Limited on November 2006. 44Whereas in 2003, following the Durban declaration, a National Park was considered urgent, the same year, on a much larger scale, Governement decisions to build up foreign investment have increased opportunities for mining exploitation in Madagascar. In this framework, an Australian firm (Ticor Limited) and a South-African company (Kumba Ressources Ltd) established a joint venture with Office des Mines Nationales et des Industries Stratégiques (OMNIS)13with respect to exploration, development and exploitation of certain prospective ilmenite properties in the Tuléar-Morombe region in a development zone of 160 km from North to South, distributed in four sectors. 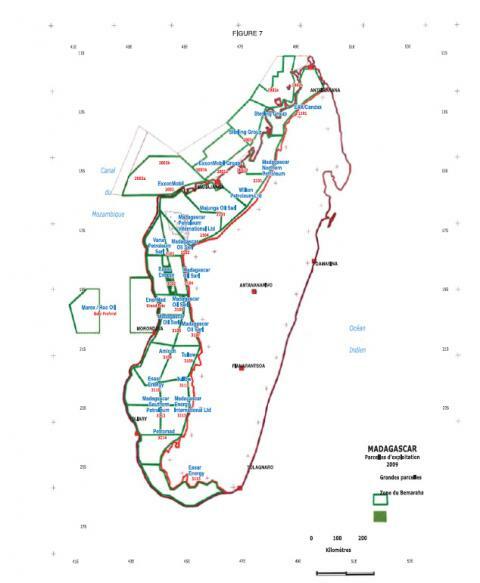 Exploration Madagascar, a subsidiary of Madagascar Resources, which signed a partnership agreement with Ticor/Kumba in 2003, holds the exploration permit14. 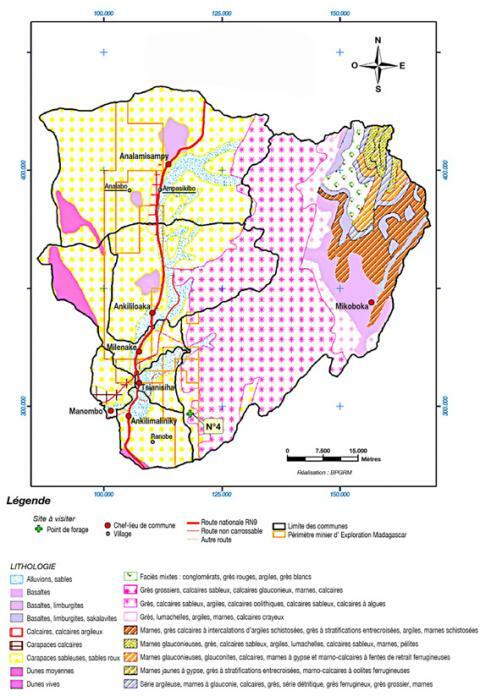 Figure 6 shows Exploration Madagascar’s mining acreage in the portion of the 4 communes concerned by the Mikea forest and part of FIMAMI. The negotiations on the boundaries were finalised in 2008 after each party had agreed, with difficulty, to concede, on each side of its intervention zone, the most strategic sites for the future of the two projects. Production will begin in the sector of Ranobe. Mineral extraction will have a large impact on the environment, which also raises the problem of how to export the minerals towards South Africa and through which route (from Morombe port, and then transportation by truck, or a pipeline from the site of production towards Tuléar). Geological map (South-West coast of Madagascar). Route national RN9, national highway RN9; périmètre minier d’exploration, border of mining exploration; alluvions, alluvium; basaltes, basalts; calcaires, limestone; carapaces, shell; dunes, dunes. 45Alongside this imminent lage-scale mineral extraction project, oil exploration also concerns the region15. Negotiations were renewed in 2004 with the Malagasy Government on the allocation of exploration zones. In 2008, 20 on shore and 7 off shore blocks were attributed to various oil companies from the North-West to the South of the island. The Masikoro region is divided into two blocks from Morombe to Tulear: block 3110 in the North was assigned to Essar Energy and block 3112 in the South to Madagascar Southern Petroleum. Essar Energy, an Indian company registered in Dubai, is exploring on the eastern periphery of the National Mikea Park (Fig. 7). 46Government policies do not have the same environmental preservation goals but result in contradictory projects in the same region and at the same time. Biodiversity protection in the Mikea forest has led to the definition of a conservation territory, the National Mikea Park. For the ilmenite mining project which will generate a huge amount of work, the firm Exploration Madagascar is currently carrying out environmental and social impact evaluations in order to formulate a strategy and an environmental conservation plan as well as a plan for post-production site rehabilitation (15 years). Furthermore, the firm seeks to integrate the development of the mining project within a regional development process. 47Regarding petroleum extraction, the Madagascan oil code, dating from 1986, needs to be updated as it has large gaps, especially with regards to the environment. It is not unusual17. It is not uncommon to see oil sites encroach upon PAs. Therefore, until the publication of the decree that will define the Mikea forest as a PA, a temporary interministerial order that concerns the protection of the future PA named « Mikea complex » has been established in order to avoid overlaps between the oil blocks and the complex. 48Encroachment and overlaps are situations that reflect the difficulties of mapping the new territories that fall within (and around) the Mikea forest. There is a sharing of space for exclusive uses (biodiversity, ilmenite, oil) within a single area. These processes of territorial fragmentation lead to incertitude and generate socio-spatial inequalities. For the Masikoro populations that acquired the land by clearing the forest for maize culture, the three new territories represent, in different ways, a disappropriation. 49This study presents the dynamics of agrarian and environmental change in Madagascar over almost 90 years. The reconstruction of the history of deforestation contributes greatly to our understanding of the urgent necessity of maintaining sustainable management, which has found a solution in 2008. But this research also highlights the complexity of environmental management in a region where deforestation is severe, the value of biodiversity is high, and the competing claims on a single territory are conflictual. On one hand, public policies recognize the urgency of creating a PA in defence of the protection of biodiversity; but on the other hand, for economic reasons, launch activities that threaten the environment both by bordering the future Park and by generating at another level large-scale development in the region. The Mikea forest is under many different pressures and one can wonder how, in this framework, deforestation can be curbed and natural ressources managed. 50The strong overlap between ecological and economic goals causes confusion, in particular for the local populations that are strongly encouraged to become involved in participative management processes, in the name of good governance of the protected spaces and areas. But on this backdrop of uncertainty and complexity that renders difficult the perception by the various actors of common problems, how can the participation of local populations be made a reality? Aubertin, C. and E. Rodary (eds. ), (2008), Aires protégées, espaces durables?, IRD Editions, Montpellier. Blanc-Pamard, C. (1999), “Le maïs et la cendre, film écrit et réalisé”, film, CNRS/CEA- GEREM-IRD/CNRS - IRD Audiovisual. 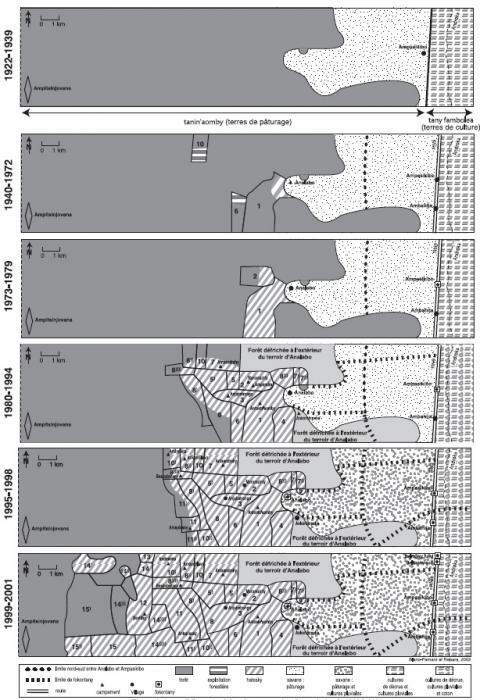 Blanc-Pamard, C. and F. Rebara (2001), “L'école de la forêt : dynamique pionnière et construction du territoire”, in S. Razanaka, M. Grouzis, P. Milleville, B. Moizi and C. Aubry (eds. ), Sociétés paysannes, transitions agraires et dynamiques écologiques dans le sud-ouest de Madagascar,IRD/CNRE Editions, Antananarivo. 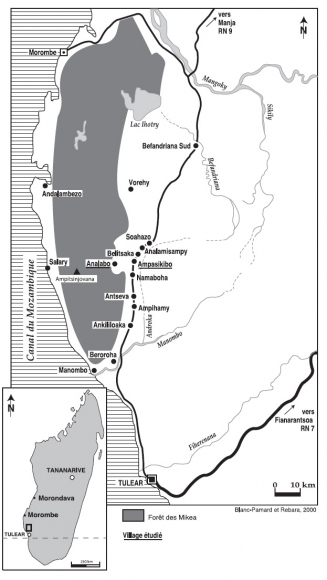 Blanc-Pamard, C. (2002b), “Territoire et patrimoine dans le Sud-Ouest de Madagascar : une construction sociale”, in M.C. Cormier-Salem et al. (eds. ), Patrimonialiser la nature tropicale, IRD Editions, Montpellier. Fauroux, E. (1997a), “Les représentations du monde végétal chez les Sakalava du Menabe”, in J.-M. Lebigre (ed. ), Milieux et sociétés dans le sud-ouest de Madagascar, Bordeaux University Press, Bordeaux. Fauroux, E. (1997b), “De la complémentarité à la concurrence : Sakalava et migrants dans l'espace social de l'ouest malgache”, in J. Bonnemaison, L. Cambrézy and L. Quinty-Bourgeois (eds. ), Les territoires de l'identité. Le territoire, lien ou frontière?, L’Harmattan, Paris, pp. 269-281. Fauroux, E. (2000), “La forêt dans les systèmes de production ouest-malgaches”, in Y. Gillon, C. Chaboud and J. Boutrais (eds. ), Du bon usage des ressources renouvelables, IRD Editions, Montpellier. Fauroux, E. (2001), “Dynamiques migratoires, tensions foncières et déforestation dans l'ouest malgache à la fin du XXème siècle”, in S. Razanaka, M. Grouzis, P. Milleville, B. Moizi and C. Aubry (eds. ), Sociétés paysannes, transitions agraires et dynamiques écologiques dans le sud-ouest de Madagascar, IRD/CNRE Editions, Antananarivo. Grouzis, M., S. Razanaka, E. Le Floc’h and J.-C. LePrun (2001), “Évolution de la végétation et de quelques paramètres édaphiques au cours de la phase post-culturale dans la région d'Analabo” in S. Razanaka, M. Grouzis, P. Milleville, B. Moizo and C. Aubry (eds. ), Sociétés paysannes, transitions agraires et dynamiques écologiques dans le sud-ouest de Madagascar, IRD/CNRE Editions, Antananarivo. Géographie régionale du sud-ouest de Madagascar. Association des Géographes de Madagascar, Imprimerie du FTM, 188 p.
Humbert, H. and G. Cours-Darne (1965), “Notice de la carte de Madagascar”, Extrait des travaux de la Sect. Sc. et Tech. de l'Institut français de Pondichéry, Institut français de Pondichéry, Pondichéry. Hoerner, J.-M. (1986), Géographie régionale du sud-ouest de Madagascar, Association des Géographes de Madagascar, Imprimerie du FTM, Antananarivo. Jarosz, L. (1996) “Defining deforestation in Madagascar” in R. Peet and M. Watts (eds. ), Liberation Ecologies, Routledge, Abingdon and New York pp 148-164. Kull, C.A. (2004), Isle of Fire. The Political Ecology of Landscape Burning in Madagascar, University of Chicago Press, Chicago. Lasry, F., M. Grouzis, P. Milleville and S. Razanaka (2001), “Dynamique de la déforestation et agriculture pionnière dans une région semi-aride du sud-ouest de Madagascar: exploitation diachronique de l’imagerie satellitale haute résolution”, Presentation at international symposium Les régions arides surveillées depuis l’espace. De l’observation à la modélisation pour la gestion durable, Marrakesh, Morocco. Lasry, F., C. Blanc-Pamard, M. Grouzis, P. Milleville and S. Razanaka (2005), Pratiques paysannes et environnement dans le sud-ouest de Madagascar, CD-ROM, IRD Editions, Montepellier. Lebigre, J.-M. (ed) (1997), Milieux et sociétés dans le sud-ouest de Madagascar. Bordeaux University Press, Bordeaux. Milleville, P. and C. Blanc-Pamard (2001), “La culture pionnière de maïs sur abattis-brûlis (hatsaky) dans le sud-ouest de Madagascar. 1. Conduite des systèmes de culture”, in S. Razanaka, M. Grouzis, P. Milleville, B. Moizo and C. Aubry (eds. ), Sociétés paysannes, transitions agraires et dynamiques écologiques dans le sud-ouest de Madagascar, IRD/CNRE Editions, Antananarivo. Morat, P. (1973), Les savanes du Sud-Ouest de Madagascar, Mémoires ORSTOM n° 68, Paris. Neuman, R. (2005), Making Political Ecology, Oxford University Press, Oxford. Razanaka, S., M. Grouzis, P. Milleville, B. Moizo and C. Aubry (eds.) (2001), Sociétés paysannes, transitions agraires et dynamiques écologiques dans le sud-ouest de Madagascar, CNRE/IRD Editions, Antananarivo. Sarrasin, B. (2007), “Le projet minier de QIT Madagascar Mineral à Tolagnaro (Fort-Dauphin, Madagascar) : quels enjeux de développement?”, Afrique Contemporaine, Vol. 221:207-223. Seddon, N., S. Butchart, J. Tobias, J. Yount, J. Ramanampamonjy and H. Randrianizahana (2000), “Conservation issues and priorities in the Mikea Forest of south-west Madgascar”, Oryx, Vol. 4:287-304. Zimmerer, K. and T. Bassett (eds.) (2003), Political Ecology: an integrative approach to Geography and Environment-Development Studies, Guilford Publications, New York. Zimmerer, K. (ed.) (2006), Globalization and New Geographies of Conservation, University of Chicago Press, Chicago. 1 Situated west of the mountains of Ibara, the Masikoro stretches between two rivers, the Mangoky to the north and the Onilahy to the south. 2 The Mikea, forest people, differ from the neighboring populations by their way of life (hunting and harvest) and their adaptation to the lack of water (Stiles, 1991; Yount et al., 2001). 4 If one believes in the sakalava traditions of Menabe, all the regions found between the Mangoky and Fiherenena rivers were considered to be the tanindraza of the Masikoro, who probably used it as a passage. The Mikea of the forest and the Vezo on the coast are marginal occupants, even if they have been there a long time. 6 Appui à la Gestion Régionalisée et à l'Approche Spatiale, a public institution charged with support for regional management and a spatial approach. It is one of the executive agencies that collaborate with the Minister of the Enviroment to implement the PAE. 7 Office National pour l'Environnement, National Office for the Environment, is the organization which coordinates and executes environmental programs. 8 Flkambanana MIaro ny Alan’ny Mikea. Association of mayors of adjoining communes in the Mikea forest. 10 The issue of limiting pasture for breeders and their herds is an important issue in the discussions. 11 Presided by the Region, this committee is composed of State organisms concerned by the creation of the Park, in particular the Regional directorates for Environment, forest and tourism, Agriculture, livestock and fishing, Decentralisation and land planning, Mines and energy, and the districts. 13 OMNIS (Office des Mines Nationales et des Industries Stratégiques) is a government agency of the Malagasy State charged with oversight and administration of the country's strategic resources. See also Sarrasin 2007. 15 The oil potential of Madagascar has been confirmed. The development of new projects, especially Bemolanga and Tsimiroro in the west, provides tangible evidence. 16 OMNIS (Office des Mines Nationales et des Industries Stratégiques) is a government agency of the Malagasy State charged with oversight and administration of the country's strategic resources. 17 Began in 2007, the code should be finalised by the end of 2009. The code will not take effect until around May 2010, after the decree is announced, which will be done by ordinance. First the code will need to be validated by an interministerial committee. One of the goals of the new code is the creation of a legal framework that aims especially to attract foreign investment in the sector and meet the requirements of the global market. In addition, the size of the oil blocks will be reduced from 15,000 to 6,000 km2. Currently 16 companies are active in the sector, in 26 projects.